In this article, we'll show you how to display information from your Intercom account on your Geckoboard dashboard. 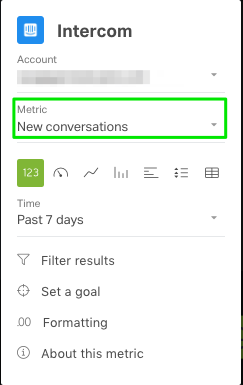 Adding this data to a dashboard allows you and your team to keep an eye on the volume of conversations, companies and users, spot issues with your SLAs quickly, stay on track to hit your goals and, above all, deliver better service to your customers. It is possible to edit these presets to present the data in a way that works for your needs. You can also select the option to Build your own widget and display other metrics, timeframes or ways of grouping or splitting the data. Hover your cursor over the empty dashboard square you would like to position your widget and click the + button. Alternatively, click Add widget, located in the top right of your dashboard. Search for Intercom using the Search sources field. Alternatively, you can also scroll down the alphabetical list of integrations until you reach the Intercom integration. Click on the Intercom integration. Choose an option from the list of preset visualizations or select the option to Build your own widget from the bottom left of the list. Is this is your first Intercom widget? 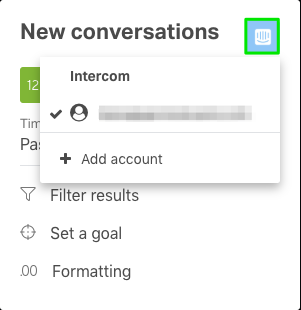 You'll need to connect your Intercom account to Geckoboard. If not, you can skip to configuring your Intercom widget. 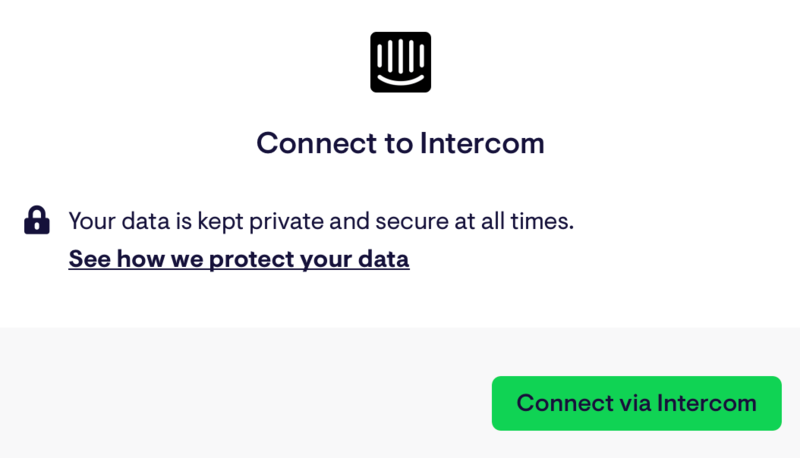 When adding your first Intercom widget, you'll be asked to create a connection and authenticate your Intercom account so that we're able to collect your data and display it on the dashboard. You only need to create this connection once – we'll take care of the rest. Click on the Connect via Intercom button. Our Intercom integration uses oAuth to connect to Intercom, so if you're already logged into Intercom on your browser, you will jump straight to the widget configuration screen after a few seconds. If you're not logged in to Intercom, a pop-up window will appear and allow you to log in for account authorization. The first time you connect to Intercom, we'll fetch data from the last two weeks. That could take a little while, but this will happen only once (per new Intercom connection) and will speed up your experience from then on. 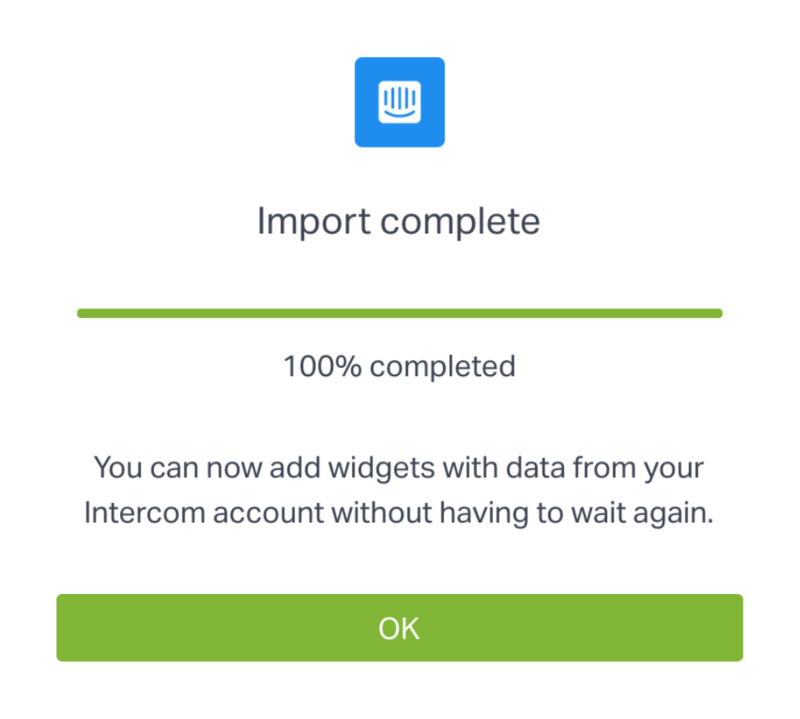 You're now ready to configure your first Intercom widget! You may need to create Intercom widgets using a different account to the one you used to create your first Intercom widget. Make sure that you are logged in to the correct Intercom account elsewhere in the browser or logged out of Intercom completely. From the top right hand corner of the widget configuration page, click on the name of the Intercom connection being used to create the widget. Click on the Connect via intercom button. If you're already logged into Intercom on your browser, you will jump straight to the widget configuration screen after a few seconds. If you're not logged in to Intercom, a popup window will appear and allow you to log in for account authorization. The widget configuration screen enables you to select the metrics you want to show, as well as choosing the visualization you'd like to use and adding any filters to the data. You'll see a preview of the widget as you create it. This will use real data from your Intercom account. Each time you make a change you'll see a message at the bottom left of the preview to indicate whether we're still collecting this data or whether it's complete. Use the dropdown menu to select the Metric you'd like to display. Select the visualization you want to use from the options below the metrics. Not all visualizations are appropriate for all metrics and we will only show the visualizations that will be able to provide data for your chosen metric(s). Using appropriate visualizations can make a world of difference while consuming your dashboards and can help inspire action. We’ve created this handy flowchart which makes it easy to identify the best visualization for the metric you're looking to display. Select a Time value that you'd like to see data for. You can use the Past 7 or 14 days option to track the previous 7, 14 full days, or the Today, This week option to show the calendar day or week in progress. It is also possible to use a Custom timeframe up to the last 336 hours, 14 days, 2 weeks. We always count the week as beginning on a Monday in this Intercom integration. If you are using a line chart or number widget, you may want to show a comparison to the same metric over the previous time period. A number widget can have either a comparison or a goal but not both. If you add a goal, the comparison will no longer be visible. You may need to Group your data by a particular value in order to create a chart, leaderboard or table so that we know which values to use for rows or labels or for the horizontal axis of a chart. If you're creating a line or column chart, and haven't chosen additional metrics to compare, you may want to split the data, for example to show performance for particular within the same chart. It is only possible to use the Split by option when looking at a single metric. As with additional metrics, the maximum number of columns available is 3 and the maximum number of line chart series is 9. If more than this is available, you will not see all of the available data. Add any optional Filters to refine this data and click on the Apply button. When adding filters, you'll be taken to a new menu and can choose a filter from the dropdown options and a value that you'd like this filter to match. Most filters allow you to select that it is or is not a specific value or that the filtered option has any value or has no value. Time based filters, such as Created at allow you to select a timeframe of the Past 7, 14 or Today, This week. If necessary, enable the option to set a Goal and fill in your goal value. You can also specify whether it's a Less than or More than goal. If the metric is a duration, you'll need to complete the goal in days, hours and minutes in the separate boxes for each. 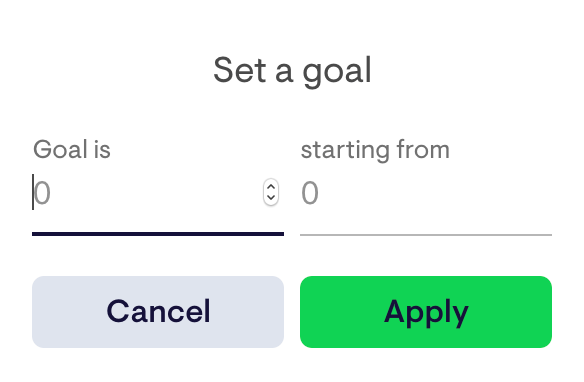 If you are using a number widget with a comparison, this will be disabled when you add the goal. It is not possible to show both a comparison and a goal within a number widget. You can use the Fine-tune Menu to change the number of decimal places used or add additional information about the values being displayed. Instructions for this are available here. And you're done! Click anywhere outside the menu to exit. Which metrics are available in this integration? Displaying the Intercom widgets Median time to close or Median first reply time? You may have noticed discrepancies between the data displaying on your widgets and on Intercom Reporting. If so, we can explain why. If you're not sure which metrics to track, you might be interested in our SaaS Metrics Generator, which can help you find the right metrics and learn more about them. Visualizations powered by the Intercom integration refresh every 10 minutes.